The first time I was hauled off to Santa Muerte’s realm I was sure that I had finally met Her. But Muerte isn’t the Big Beast who rules over Nod. I asked Muerte and she told me. She said that the skeletons are her subjects and that is all. 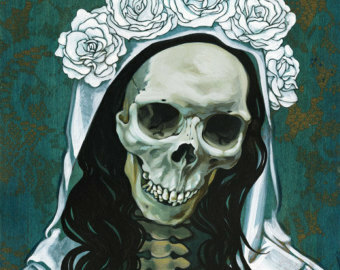 I found Muerte to be quite beautiful in her white, frilly dress. Like a bride. She knew too. Knew that I was captivated by her dark beauty. Then she told me that Life-in-Death was terrible. There was no beauty in her at all. She was mighty and horrible to behold. Just the sight of her would drive a man like me insane. And I knew it to be true. And that’s how I learned that it is Life-in-Death that rules over the Land of Nod. He’s the worst one so far. The night I encountered Nyarlathotep I cried. He was hatred incarnate. Wicked and evil to the core of his being. Throughout the tortures and the taunts he would pause long enough to recite from a large tome. In that litany of foul blasphemies that spouted from his mouth there was one refrain that I could understand. One refrain that I recognized from some ancient poem. And then I found myself in a vast underground labyrinth that I knew to be that fabled city of Iram. The Atlantis of the sands. The thoroughfare that I traversed had once been a grand road where the gigantic statues of beast-headed gods glared down at processions of slaves and citizens offering obscene obeisance to their megalomaniacal pharaoh – their god incarnate. But now that great road was dark and cavernous. It was littered with the debris of once majestic structures. Slave-hewn blocks that dwarfed me and made me to feel the oppressive weight of the Egyptian eons. As I trudged the sands of this ancient, buried empire I gazed in wonder at the immensity of the ruined architecture looming over me. And then the mummies came. Swirling funnels of sand that coalesced into the forms of withered, long forgotten priests. Here was one of Anubis. There one of Bastet. There one of Sobek. And here one of Thoth. Each one intent on dragging me down into the darkened crypts of the Sahara where dwells the foulest mysteries of ancient mankind.